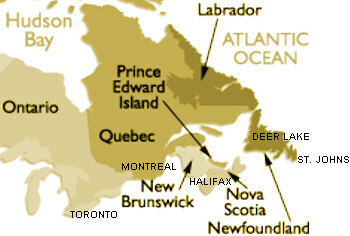 A Newfoundland hunting trip by motorcoach, car, bus or motor home is just as convenient. Marine Atlantic operates modern car ferries all year round from North Sydney, Nova Scotia, to Port aux Basques, Newfoundland. Throughout the summer, a second ferry from North Sydney to Argentia is added to accommodate visitors to the eastern part of the island. Patey and Sons Outfitting recommends that you take the ferry to Port aux Basque since it is much closer to drive than Argentia. If you decide to drive to Newfoundland, you will have to take the Trans Canada Highway in Port aux Basque northeast to Deer Lake. When you arrive in Deer Lake, take the Viking Trail, Route 430, north through Gros Morne National Park to River of Ponds. Patey and Sons Outfitting will meet you there. Patey and sons outfitting is only a few hours away by commercial airline. Air Canada operates a regular service that connects with most major centres in North America and Northern Europe. Local schedules provide convenient air travel between points within the province. Patey and sons outfitting recommends that you make reservations early for your Newfoundland hunting vacation. If you decide to fly we will meet you at the Deer Lake airport and bring you to our base camp at Raft Pond. 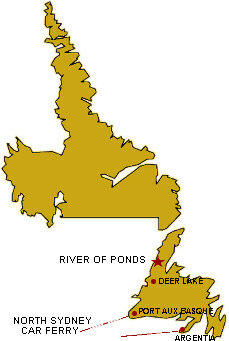 An additional $250.00 per hunter for round trip transportation between Deer Lake and River of Ponds.